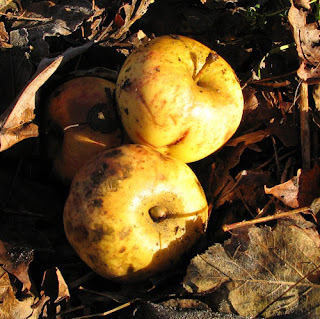 Small Measures: Clearing lines, clearing apples? So the electric company clears branches from the power lines, in their ongoing maintenance to avoid a repeat of the extended outages we had in the Ice Storm of '98. They hire a pretty decent tree-cutting company to do so. Vaillancourt (if I spelled it right) tends to cut very tidily, stacking the branches and logs away from lawns and traveled ways. On the other hand, they mostly cut as to what's needed for the lines, over what might be best for the tree (in my very limited clue about trees) (although I suspect they'll do both when they can). This is all well and good, and in fact is why there's habitat for Indigo Buntings near our otherwise fully wooded second-growth land. On the other hand, they don't come knocking on your door to say, "Hey, we'll be cutting off another 5 branches from your maple that we could've done last year" or "Hey, just want to let you know that we're taking the entire top third of your apple tree." I wish they had! I walked out in the front yard the other morning, and thought "that's odd, it seems lighter than it should be." And yup, looking around, exactly those branches/tops were gone. The apple is one of about a half-dozen still surviving (there are some dead ones) from the time when this was half-pasture/half-orchard. The state actually has a program for saving and releasing old apples like this; I'd've liked to take out 2 of the 4 maples crowding it (except they also guard it from the depredations of the snow plow). It's by far the largest (trunk diameter at least 12 inches) and probably the healthiest of the lot (or was? Spring will tell). I wish I knew what kind of apple it is! My best guesses are something crossed with Lodi or Yellow Transparent (clues from Vermont Apples). The fruit ripens more latish summer/early fall -- why didn't I take better notes at the time? Argh -- which is a bit late for both those varieties, though. Except that we're up the mountains, so maybe not.